“They come from all over the place,” said Dolly Robertson, who plays a key role in the exhibit hall each year. This year was no exception, with entries from Castine to Mount Desert Island to Bangor. Each entry, whether it was photography, children’s art, crochet items or flowers, was up on the judging block in various categories of competition. “There are two judges for most categories, and some times there are four if there are a lot of entries,” said Robertson, adding that four judges were needed in the crochet category this year because of the high entry number. The overall numbers of entries were down this year, according to Robertson. There were 754 exhibits from 200 exhibitors this year, bringing the total number of exhibits down. 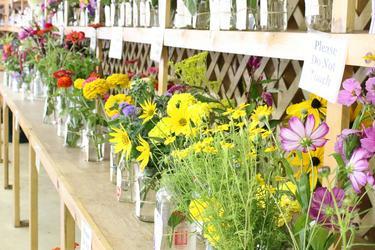 Last year there were 843 from 204 exhibitors. Despite the lower numbers, Robertson said that the exhibit halls were still full of spectators and people passing through throughout the weekend. Those numbers can be contributed to the “beautiful weather” throughout the weekend, which brought a packed house to the fairgrounds each day of the fair. 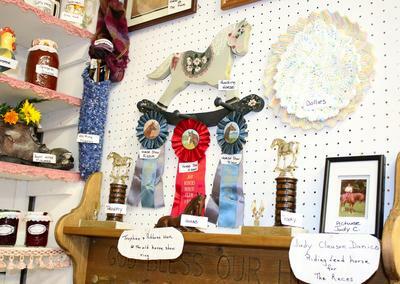 While there were several local artists and crafters who submitted work, the prizes went to outside entrants, some of whom have been entering submissions for years, according to Robertson. One of those entrants was crafter Carla Bragan, a longtime participant from Sebec, who won Best of Show in the crafting category for her hooked rug. 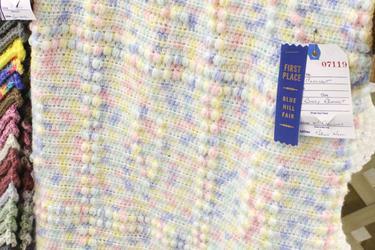 Mount Desert Island artist Gloria Avner won Best of Show in the art division for her water color painting entry. 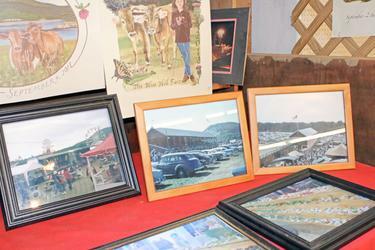 Exhibitors began to drop off their work before the fair opened on Thursday, and people were busy setting up exhibits and getting their sections ready before the gates opened. 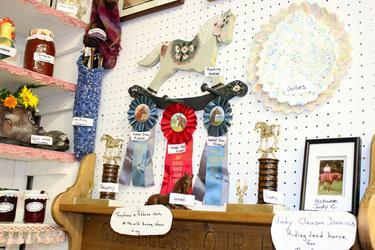 While all the blue ribbons were pinned early in the fair weekend, the work was still displayed all day every day for people to check out. Besides arts and crafts, blue ribbons were handed out for flower exhibits, vegetable exhibits and even a prize for the largest pumpkin. See a list of fair results on page 11. Drew Allen of Sedgwick was the winner of the largest pumpkin, as his entry weighed in at a whopping 260 pounds.